If you think of a Task as a card where you keep track of the details you need to do it, a Tag is like a post-it note stuck to it. The advantage of all this being digital is that you can search on the Tag and save that as a List if required. A search for something like tag:urgent will find all Tasks that have a Tag called urgent. You can put Tags on a Task manually by clicking in the “Tag” field and either selecting an existing tag or creating a new one. Tags you put on a Task will stay there until removed. Some of our customers mark steps with a Tag like “Active” and then have an easy search so only show Tasks at those steps. They could also have listed all the steps in the List or search but the Tag idea works a little easier. Other customers use Tags to mark tasks as “Urgent” or “Requires Approval”. Here’s what a Tag looks like in List View. You can see the “Project A”, “Project B” and “Project C” Tag on the Tasks in the list. teamfocus lets you also put Tags on steps and the paths between steps (called Moves). 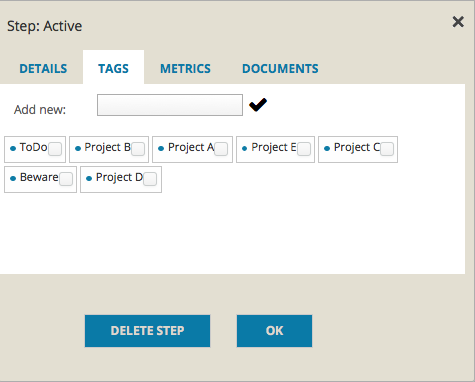 This way you can automatically have a Tag on a task when it’s at a particular step. These Tags however are not removable on the Task view screen (as indicated by a different color) and will automatically be removed when the Task no longer is at the step that has the Tag. 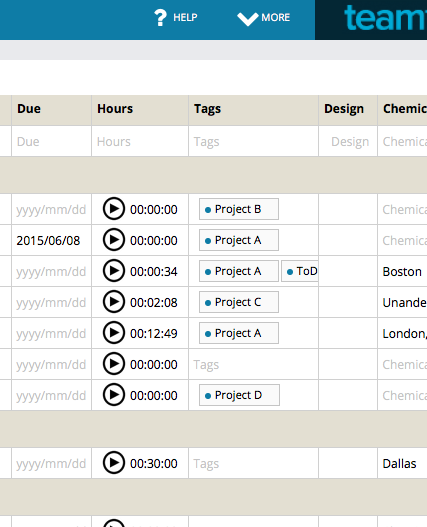 Here’s the Workflow Editor where you can specify task Tags on any step. You can also create a step at this time if required. Once Tags are made, they exist for your whole Team.